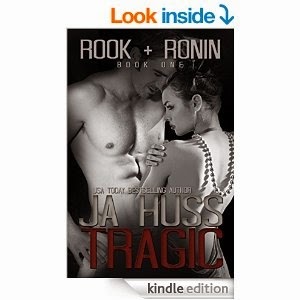 Review of Tragic: Book One in the Rook and Ronin Series by JA Huss. Hello everyone and welcome back to I Geek Books. Today I tough I do a review on this book since I recently found it and its a series. But not only that, is a series that is complete. So there won’t be a gut wrenching feeling and/or a long wait to get to the next book; this for me is always a plus when looking for a series. If its finished I will most likely buy it more often that if its not. What about you? I’m now curious to know if you take this into consideration when purchasing a book that is part of a series? I have to tell you, I am very exited to have found this book, exited does not even cover it, I am beyond thrilled. I can’t wait to be able to get to Manic; book # 2. This series is another mater piece of the world of people who are as it is the case, in the right place, at the right time. How you can find exactly what you need, or what you think you need in the most unimagined place on earth, the one place you did not picture yourself at, and how if you grab on to something with all your might it can be a stepping stone. A way to achieve what you want to be able to get to your dreams, but also what you think you need to become the person you always tough you should be, and still want to be. Its all about the journey to get from when you are, by circumstances well beyond your control to where you could be by a turn of fate and some luck. Did I gave to much away? I hope I didn’t… The books are written with an attention to detail that is amazing, the descriptions are great and make your feel like you can see the whole book play in your mind just the way the author has created it for you to enjoy. I have loved this story and I hope you will too. Another great thing about this book is that you can find it in audible (this is how I first found it, looking for Three Two One to see if there was an audible copy of that one) and for me it was great to immerse in the audio book. At this time I have to do a lot daily (I won’t bore you with the details) and Audiobooks are my go to source of entertainment. Unfortunately the other two books as of today (March 19th, 2015) is only on kindle and paperback so far, I could not find copies of Hardcover ones. And this is all for today, I hope you have enjoyed. Don’t forget to give me a thumbs up and share if you like/found this review helpful. Have a great rest of the week and a great book to keep you company. Posted on March 19, 2015 March 19, 2015 by ccalvarez90Posted in UncategorizedTagged #completeseries, #goodbooks, #GreatAuthor, #greatseries, #igeekbooksaudioreview, #igeekbooksreview, #JAHuss. Previous Previous post: Review: Three Two One by JA Huss.